Pragya liaises with the national government in countries that it operates in and with regional networks and influencers of policy, in order to input significantly into policy for target areas and peoples. Apart from this, we have often been commissioned by governments to provide policy inputs or facilitate deliberations and consultations aimed at policy formulation. With our UK and US offices, we are also positioned to input into global deliberations on key issues and ensure that the voices of the disadvantaged are heard. National and international seminars and conferences are held that bring the knowledge to a cross-section of development workers and policymakers/influencers; international events are participated in for ensuring an even wider audience and support base. Papers are published in high quality scientific/policy studies journals for a targeted audience of policy-shapers. Presentations are made to specific policymakers/shapers as well, multi-stakeholder dialogues and deliberations are conducted, and buy-in of various stakeholders are elicited. We network with civil society to express our solidarity for common causes and have also set up networks and forums to work for the specific issues of remote areas and indigenous communities. 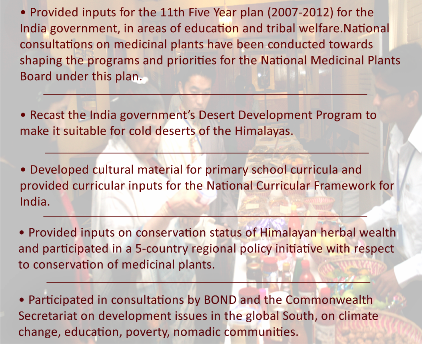 A key characteristic of the forums we support is the significant participation of indigenous communities and their interaction with policymakers, support institutions, civil society and the wider public, through forum processes. A platform for cultural actors of the Himalayas, Himalayan Heritage promotes access to Himalayan culture and enhances its understanding among the wider public. It also seeks to build solidarity among culture actors and workers of the Himalayas, and a support system for them. The acceleration of climate change in recent years is one of the challenges that the world is facing today. The “International Symposium on Climate Change Adaptation�? to be held in New Delhi from 1 – 3 February 2017, aims to address the issue. Pragya is one of the co - organizers of the event that will bring together scholars, institutions and practitioners working in the field of climate change onto a single platform to share the best practices and research in the field of climate change adaptation.